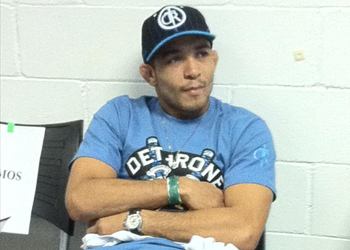 UFC featherweight king Jose Aldo (Pictured) owns a slightly blemished 19-1 professional resume and has rattled of 12 consecutive victories. Since posting a unanimous decision win over Mark Hominick in April, it seems the only thing his detractors can focus their attention on is the amount of weight the Brazilian must cut in order to hit the 145 pound mark. The spotlight got even hotter when a video surfaced last week showing the arduous process he needed to go through in order to lose 6.6 pounds on the day of weigh-ins. In fact, Aldo practically gave up with only 1.1 pounds remaining. The clip, which has since been removed from YouTube, would certainly explain why he faded so quickly against Hominick when the 5thRound came rolling around. Although a jump to the lightweight division might be inevitable, Aldo feels he can continue to compete in the lighter weight class for the time being. “Since I have been training martial arts, back from my jiu jitsu days, I have always been cutting a lot of weight,” Aldo expressed through a translator. “I feel comfortable doing it. Definitely being young at 25-years-old helps a lot. Despite the hell he had to endure the last time he took center stage, Aldo said he doesn’t intend to change anything heading into Saturday’s showdown with Kenny Florian. “Scarface” thinks what took place at UFC 129 was a one-off incident and is confident there won’t be nearly as many complications come Friday’s weigh-ins. Aldo and Florian co-headline UFC 136 inside the Toyota Center in Houston, Texas.